A woodpecker on the ground?? If you see what you think might be a woodpecker on terra firma, it is likely to be a northern flicker. This largish woodpecker goes “anting” on lawns and in parks – that is, it drops to the ground to search for ants, a favorite food, in the grass. And like all woodpeckers, it also spends a lot of time in trees, especially during nesting season when it raises young in a tree cavity. 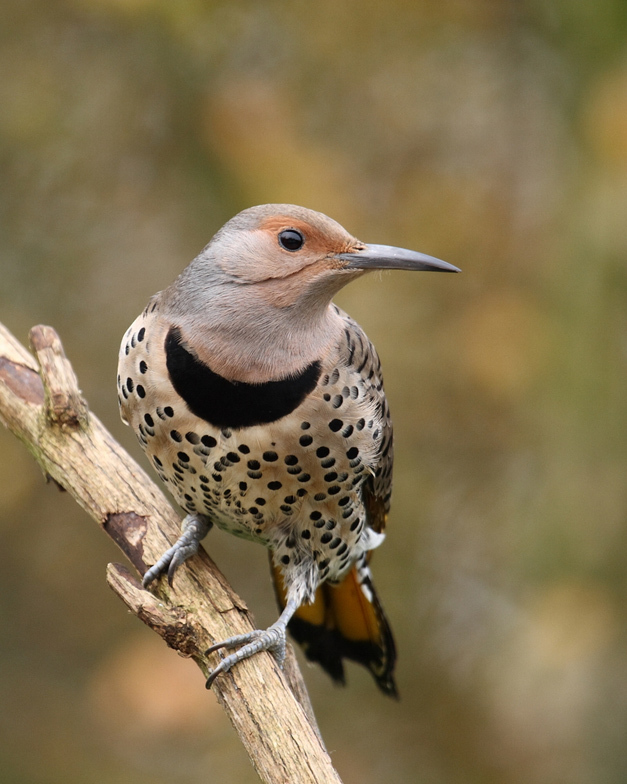 Flickers are especially satisfying to ogle through binoculars or a telescope. Besides the long, strong beak characteristic of most woodpeckers, they have an unusual array of field marks that include black bib crescent, spotted breast, brown back bars, yellow wing linings (red in the western flicker), red nape crescent, black malar stripes for the male, and white rump patch that makes them easy to spot when they fly away. They are an avian kaleidoscope of color and design. Unlike our resident downy, hairy, and red-bellied woodpeckers, flickers are migratory, though not usually for long distances. 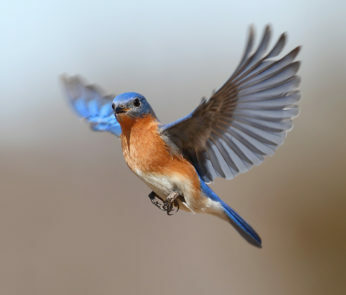 After spending the winter somewhat south of our region and sometimes into Mexico, they fly back to the Barrington area in late March or early April, signaling their arrival with their loud kew! or softer wick-a-wick-a-wick-a! When nest duties have been completed, usually in September, they fly southward again, often in large groups. Last summer a pair of northern flickers nested in a dead tree near our back door. In mid-July I watched, transfixed, as a family of youngsters emerged from the nest hole and hitched in jerky spirals around the tree. For the next few days there was lots of noisy movement – flickers are seldom quiet – that provided plenty of delightful entertainment. 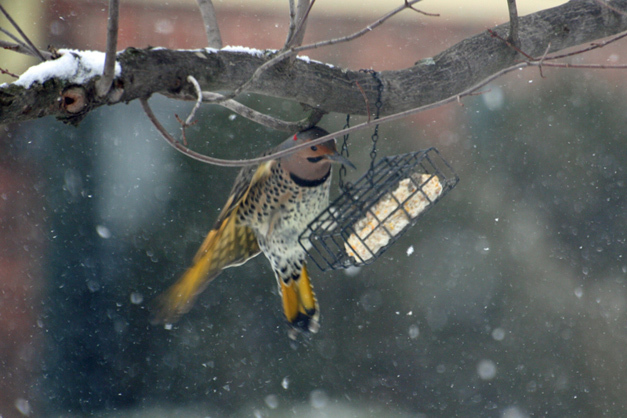 Watch – and listen – for the northern flicker. 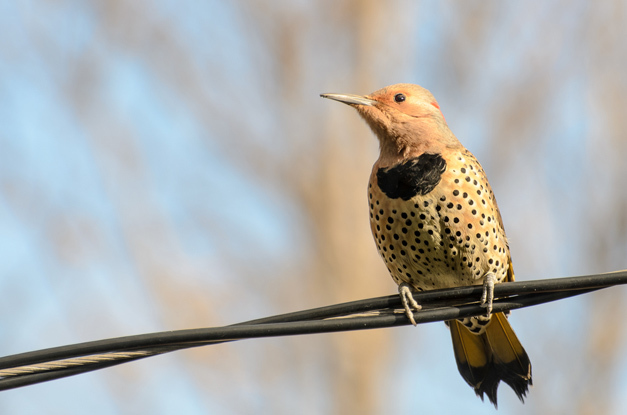 Whether it is anting on the ground, exploring tree cavities for a nest site, drumming on a trunk, or perched atop a tree branch in non-woodpecker-like fashion, the flicker is almost sure to make you smile. 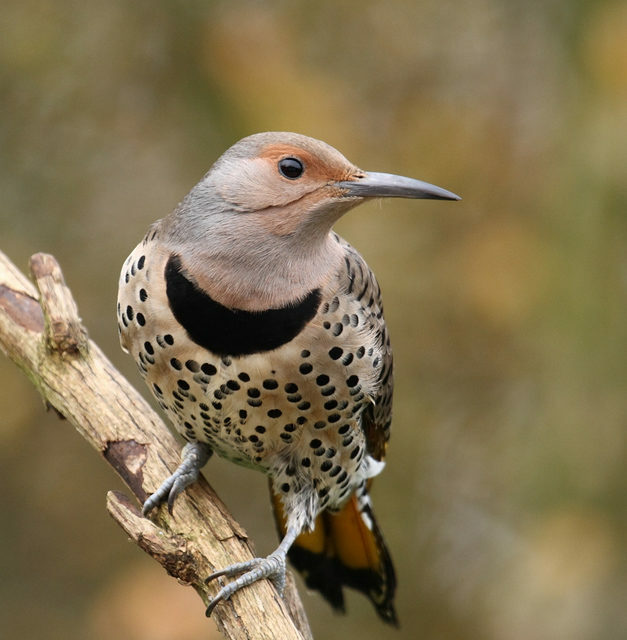 Click the arrow below for a listen to the Northern Flicker’s voice, courtesy of the Macaulay Library & the CornellLab of Ornithology. 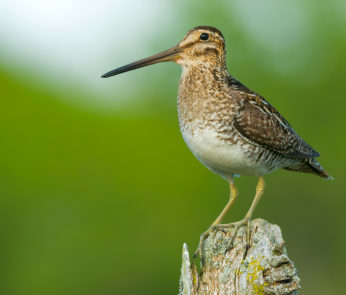 Wendy’s next two bird walks in Barrington are happening at 7:30 a.m. on Friday, May 10th, at Flint Creek Savanna (park at cul-de-sac on Brookside West, just off Harbor Road) and 7:30 a.m. Friday, May 17th, at Baker’s Lake (parking lot on Highland Ave. south of Hillside Avenue) . The hikes are free and the public is welcome to attend, but they request that you RSVP so they know you’re coming. 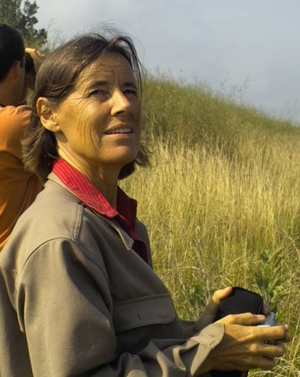 CLICK HERE for the full list of Wendy Paulson’s upcoming bird hikes in Barrington or find more information at CitizensForConservation.org.